The second leader of the Midnight Angels gang, Akutsu was a friend and kohai of Kyousuke Masaki, and was jealous of Eikichi taking some of Masaki's attention years before. He reappears full of plans to reclaim the Midnight Angels' place as the greatest of all Shonan gangs, with the Idaten (previously led by Akira Takezawa) under his control. He is also in control of Nagisa, and tries to get her to kill Ryuuji, although she ends up injured herself. Akutsu has a penchant for setting petrol fires, and has made a nemesis of Toshiki Kamishima of the Satsuriku Butai (Butcher Fighting Gang) for causing him serious injuries in this way when they were both members of the second-generation Midnight Angels. 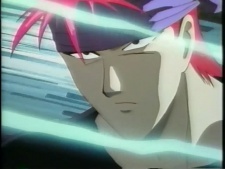 He is beaten by Onizuka and Kamishima, and returns later in the series assisting the Oni-Baku in times of need.